Glice® is proud to have won the tender for the world’s largest synthetic ice rink project. With 2200m2/24000 sqft it is the biggest plastic ice rink ever built by mankind. This artificial ice skating rink is totally custom made by Glice® and comes in the shape of an 8. It is located in the Baku Convention Park in Baku, Azerbaijan. This Glice® plastic ice rink project had been commissioned by the Ministry of Finance of Azerbaijan. 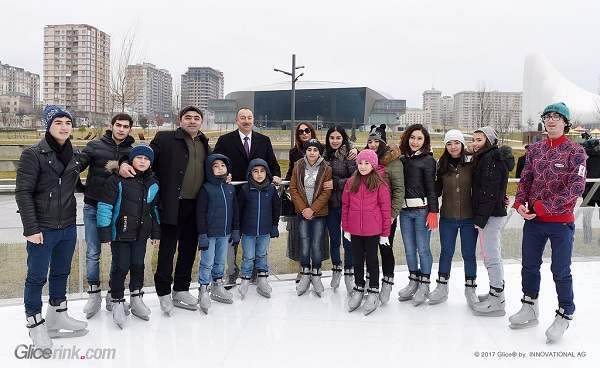 Azerbaijan’s President Ilham Aliyev himself recently did the honors of inaugurating the world’s largest synthetic ice rink in the country’s lively capital Baku. 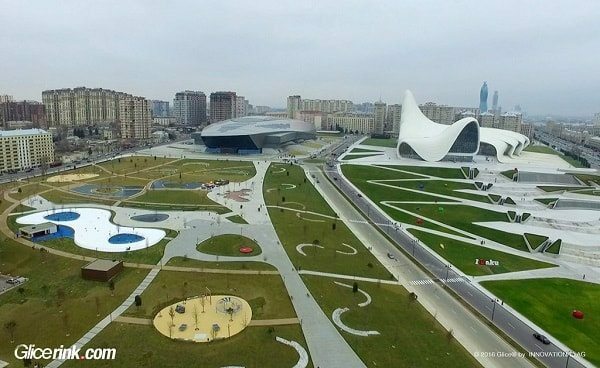 Glice® set up the groundbreaking ecological ice rink as a centerpiece amid the meadows of Baku Convention Center Park, a vast recreational area in the heart of the city. And not only did the sheer size of 2130 m2 impress the President and other first visitors, but also the unusual shape of an eight dedicated to this eye-catching and permanent synthetic ice rink installation by Glice®. 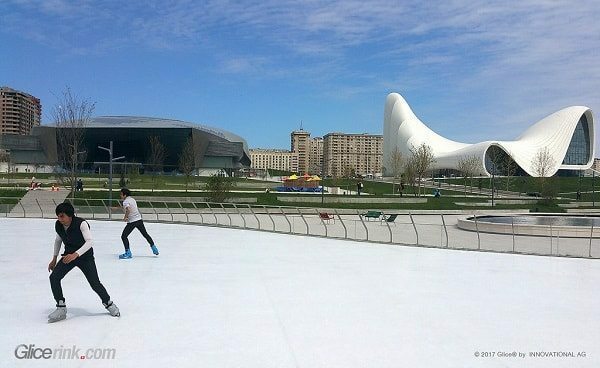 Requested by Azerbaijan’s Treasury Department, the immense artificial rink now is a new leisure milestone in the park and makes ice skating an all year around event.